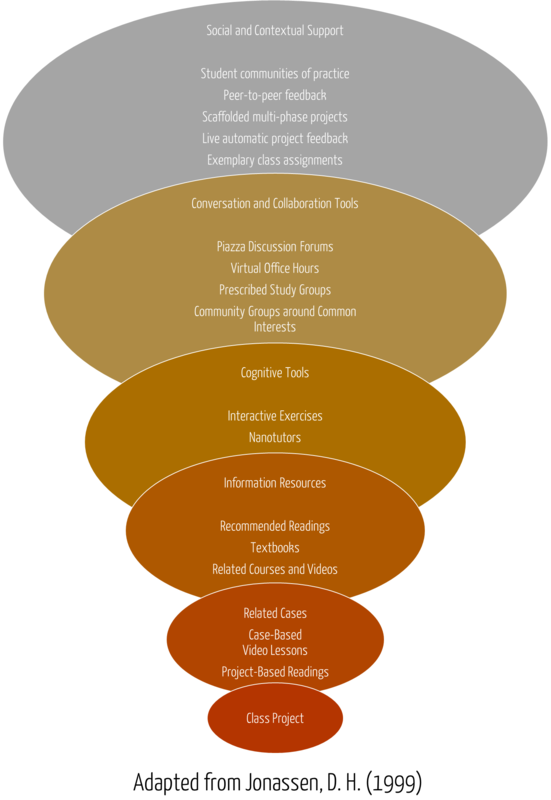 Augmenting Curriculum with Project-Based Learning and "Making"
2018: The CHI of Teaching Online: Blurring the Lines Between User Interfaces and Learning Interfaces. David A. Joyner. In Kapros, E. & Koutsombogera, M. (Eds.) Designing for the User Experience in Learning Systems. New York: Springer. 2018: Sentiment Analysis of Student Evaluations of Teaching. Heather Newman & David Joyner. In Proceedings of the 19th International Conference on AI in Education. 2018: Squeezing the Limeade: Policies and Workflows for Scalable Online Degrees. David Joyner. In Proceedings of the 5th Annual ACM Conference on Learning at Scale. 2018: Intelligent Evaluation and Feedback in Support of a Credit-Bearing MOOC. David Joyner. In Proceedings of the 19th International Conference on AI in Education. 2018: Toward CS1 at Scale: Building and Testing a MOOC-for-Credit Candidate. David Joyner. In Proceedings of the 5th ACM Conference on Learning at Scale. 2017: Harnessing professionals' motivations and experiences to improve accredited MOOC-based education. David Joyner. In Proceedings of Learning with MOOCs IV. 2017: Seven design principles for scalable for-credit CS1 education. David Joyner. In Proceedings of Learning with MOOCs IV. 2017: Using AI to Teach AI: Lessons from an Online AI Class. Ashok Goel & David Joyner. In AI Magazine 38(2). 48-58. 2017: Congruency, Adaptivity, Modularity, and Personalization: Four Experiments in Teaching Introduction to Computing. David Joyner. In Proceedings of the Fourth Annual ACM Conference on Learning at Scale. Cambridge, Massachusetts. 2017: Scaling Expert Feedback: Two Case Studies. David Joyner. In Proceedings of the Fourth Annual ACM Conference on Learning at Scale. Cambridge, Massachusetts. 2017: Introduction to Computing. David Joyner. McGraw-Hill. 978-1-260-08227-2. 2016: Formative Assessment and Implicit Feedback in Online Learning. Ashok Goel & David Joyner. In Proceedings of Learning with MOOCs III. Philadelphia, Pennsylvania. 2016: Scaling the human expert’s role in large online programs. David Joyner. In Proceedings of Learning with MOOCs III. Philadelphia, Pennsylvania. 2016: Expert Evaluation of 300 Projects per Day. David Joyner. In Proceedings of the Third Annual ACM Conference on Learning @ Scale. Edinburgh, UK. 2016: Graders as Meta-Reviewers: Simultaneously Scaling and Improving Expert Evaluation for Large Online Classrooms. David Joyner, Wade Ashby, Liam Irish, Yeeling Lam, Jacob Langston, Isabel Lupiani, Mike Lustig, Paige Pettoruto, Dana Sheahen, Angela Smiley, Amy Bruckman, & Ashok Goel. In Proceedings of the Third Annual ACM Conference on Learning @ Scale. Edinburgh, UK. 2016: The Unexpected Pedagogical Benefits of Making Higher Education Accessible. David Joyner, Ashok Goel, & Charles Isbell. In Proceedings of the Third Annual ACM Conference on Learning @ Scale. Edinburgh, UK. 2016: Designing Videos with Pedagogical Strategies: Online Students’ Perceptions of Their Effectiveness. Chaohua Ou, David Joyner, Daniel Haynes, & Ashok Goel. In Proceedings of the Third Annual ACM Conference on Learning @ Scale. Edinburgh, UK. 2016: Design of an Online Course on Knowledge-Based AI. Ashok Goel & David Joyner. In Proceedings of the Sixth Symposium on Educational Advances in Artificial Intelligence. Phoenix, Arizona. 2016: An Experiment in Teaching Cognitive Systems Online. Ashok Goel & David Joyner. In D. Haynes (Ed.) the International Journal for Scholarship of Technology-Enhanced Learning 1(1). 3-23. Presentation: Graders as Meta-Reviewers: Simultaneously Scaling and Improving Expert Evaluation for Large Online Classrooms. The flipped presentation for the corresponding paper at Learning @ Scale 2016. Presentation: The Unexpected Pedagogical Benefits of Making Higher Education Accessible. The flipped presentation for the corresponding paper at Learning @ Scale 2016. Presentation: Expert Evaluation of 300 Projects per Day. The flipped presentation for the corresponding paper at Learning @ Scale 2016. Presentation: Designing Videos with Pedagogical Strategies: Online Students’ Perceptions of Their Effectiveness. The flipped presentation for the corresponding paper at Learning @ Scale 2016. C21U Seminar Series Talk: The Unexpected Pedagogical Benefits of Making Higher Education Accessible. David Joyner's C21U talk on the unique benefits derived from the combination of the OMSCS's unique student body and forum-based structure. GVU Brown Bag Talk: Impact of the Students in the Georgia Tech OMSCS. David Joyner's GVU Brown Bag talk on the unique role students play in the OMSCS program. Course: CS6460: Educational Technology. The Georgia Tech OMSCS course CS6460: Educational Technology, available to the public at Udacity.com. GVU Brown Bag Talk: Putting Online Learning and Learning Sciences Together. Ashok Goel's and David Joyner's Brown Bag talk on the design of CS7637: Knowledge-Based AI. Course: CS7637: Knowledge-Based Artificial Intelligence. The Georgia Tech OMSCS course CS7637: Knowledge-Based AI, available to the public at Udacity.com. 26 Apr 2018: Two full papers accepted to Learning @ Scale 2018. David Joyner has had two full papers accepted for Learning at Scale 2018, one on policies and workflows in the OMSCS and one on results from CS1 online. 13 Apr 2018: David Joyner wins the Georgia Tech Curriculum Innovation Award. David Joyner has won the 2018 Georgia Tech Center for Teaching and Learning Curriculum Innovation Award! 24 Mar 2018: Two short papers accepted to AI in Education 2018. LucyLabs has had two short papers accepted to AI in Education 2018: one by David Joyner and Heather Newman, the other by David Joyner alone. 01 Sep 2017: Bobbie Eicher and Tia Pope featured in 2017 Faces of Inclusive Excellence. Bobbie Eicher and Tia Pope were featured in Georgia Tech's Faces of Inclusive Excellence from the Office of Institute Diversity. 12 Jun 2017: Article published in AI Magazine. Ashok Goel and David Joyner have co-authored an article for the most recent issue of AI Magazine. 24 Apr 2017: David Joyner wins College of Computing Outstanding Instructor. David Joyner has won the College of Computing's 2017 Outstanding Instructor award. 20 Apr 2017: Presenting two papers at Learning @ Scale. This week, David Joyner is presenting two papers at Learning @ Scale 2017 in Cambridge, Massachusetts. 01 Sep 2016: David Joyner featured in 2016 Faces of Inclusive Excellence. David Joyner was featured in Georgia Tech's Faces of Inclusive Excellence from the Office of Institute Diversity. 16 Jun 2016: Paper accepted to Learning with MOOCs 2016. “Scaling the human expert’s role in large online programs” has been accepted for publication at Learning with MOOCs III. The paper is authored by David Joyner and covers efforts to increase human touch in Udacity's Nanodegree programs through expert project review and mentorship. Congratulations, David! 07 Apr 2016: David Joyner wins the CoC Doctoral Dissertation Award. David Joyner has been selected as the winner of the 2016 College of Computing Doctoral Dissertation Award. The award will be presented on April 25th at the CoC Award Luncheon. 29 Mar 2016: David Joyner wins the Lockheed Excellence in Teaching Award. David Joyner has been announced as the winner of the 2016 Lockheed Excellence in Teaching Award. The award will be presented on April 25th at the CoC Award Luncheon. 26 Feb 2016: David Joyner joins C21U. Effective today, David Joyner has joined the faculty for the Georgia Tech Center for 21st Century Universities. 13 Feb 2016: Ashok Goel Delivers Paper to EAAI 2016. In Phoenix, Arizona today, Ashok presented "Design of an Online Course on Knowledge-Based AI" at the 6th Symposium on Educational Advances in AI. 11 Jan 2016: Sam Bartlett joins LucyLabs. Sam Bartlett has joined LucyLabs for the Spring 2016 semester, continuing his work on developing mobile apps for increasing student retention in online classrooms by reducing the cognitive load. 14 Dec 2015: Paper on Udacity's project review system accepted to Learning @ Scale 2016. "Expert Evaluation of 300 Projects per Day", authored by David Joyner, has been accepted to Learning @ Scale 2016. Congratulations, David! 14 Dec 2015: Paper on the designing course videos accepted to Learning @ Scale 2016. "Designing Videos with Pedagogical Strategies: Online Students’ Perceptions of Their Effectiveness", co-authored by Chaohua Ou, Ashok Goel, David Joyner, and Daniel Haynes, has been accepted as a short paper to Learning @ Scale 2016. Congratulations! 14 Dec 2015: Paper on the OMSCS accepted to Learning @ Scale 2016. "The Unexpected Pedagogical Benefits of Making Higher Education Accessible" has been accepted to Learning @ Scale 2016. The paper is co-authored by David Joyner, Ashok Goel, and Charles Isbell. Congratulations! 14 Dec 2015: Paper on "Graders as Meta-Reviewers" Accepted to Learning @ Scale 2016. "Graders as Meta-Reviewers: Simultaneously Scaling and Improving Expert Evaluation for Large Online Classrooms" has been accepted to Learning @ Scale 2016. The paper is co-authored by David Joyner, Wade Ashby, Liam Irish, Yeeling Lam, Jacob Langston, Isabel Lupiani, Mike Lustig, Paige Pettoruto, Dana Sheahen, Angela Smiley, Amy Bruckman, and Ashok Goel. Congratulations, everyone! 08 Nov 2015: Paper accepted to EAAI 2016. "Design of an Online Course on Knowledge-Based AI", co-authored by Ashok Goel and David Joyner, has been accepted to the Sixth Symposium on Educational Advances in Artificial in Intelligence. Congratulations, Ashok and David! 19 Oct 2015: Paper accepted to the International Journal for Scholarship of Technology Enhanced Learning. "An Experiment in Teaching Artificial Intelligence Online", co-authored by Ashok Goel and David Joyner, has been accepted to the International Journal for Scholarship of Technology Enhanced Learning. Congratulations, Ashok and David!